To be honest, I really wanted to call this entry “defile,” since I’ve already set a precedent of bad puns for titles, but I just couldn’t bring myself to do it. My wife and I dug in deep today. “The Pods” are arriving in the next few days, so it really is time to make some decisions about what goes with us, what gets tossed, and what ends up in storage. My goal is to have as little as possible in the third category, and only what we really need in the first. We have been making some progress, but if we don’t make some bigger attempts to minimize what we are holding onto, I am afraid by default we will end up loading those pods with stuff that we simply don’t need weighing us down. I started off the day packing up cassettes and VCR tapes for donation. We actually still have a functional DVD/VCR player, so I held onto a few movies that still get watched occasionally. The cassettes were harder. I mean–I still have one of my very first mix tapes, which must date back to somewhere around 1981 or 1982…. We also got rid of a decent stack of books off of the built-in bookshelves upstairs. All in all, I would say we are close to the halfway mark for books. But really, the heavy lifting today–figuratively and literally–was in purging our four filing cabinets: two full-size and two half-size. I’ve tackled this task before in fits and starts, but today was the big push…and what a push it was. I cleared out all sorts of “important” papers, pretty much filling up a large trash bag with documents that will need to be shredded–including tax forms dating back to the 1990s and bank statements from closed accounts in states that I haven’t lived in for decades. I also wiped out all sorts of work and school related files and documents: grade books from last century, photocopied articles, and lots and lots and lots of notebooks (I kept thinking of David Byrne singing “Life During Wartime”). All of that paper will end up in the mixed paper dumpster at our local recycling center tomorrow. And finally–the hardest. I dug through years worth of the kids’ school stuff. I absolutely kept quite a few things–mostly drawings or writings that still made me smile when I looked at them again. But I cleared out whole stacks of math sheets and quizzes and tests that just didn’t pass the test of enduring value. 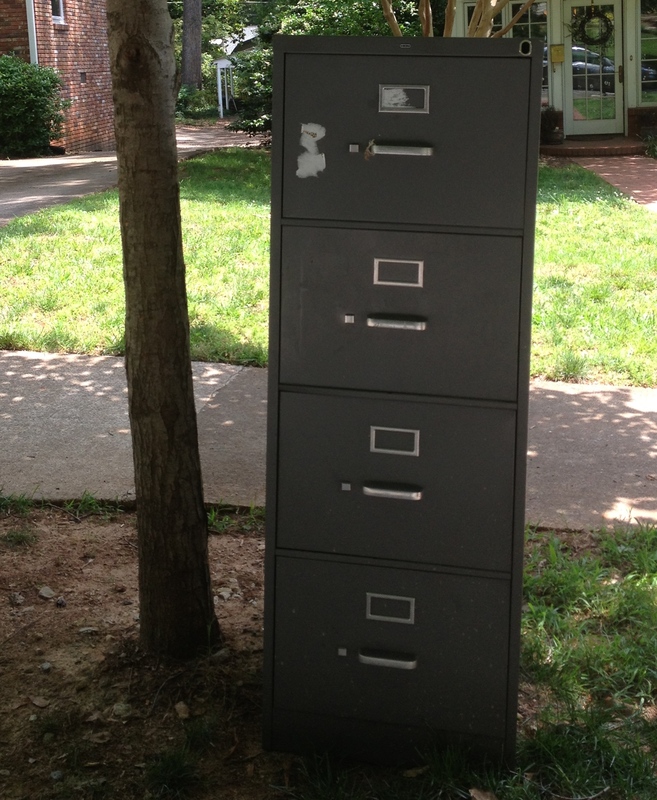 In then end, I managed to empty out our oversized, DOD-compliant, gunmetal gray filing cabinet, which I believe we originally found on the side of the road somewhere. And that’s where it ended up. I dragged it out to the curb around 5pm, and it was gone within a few hours. 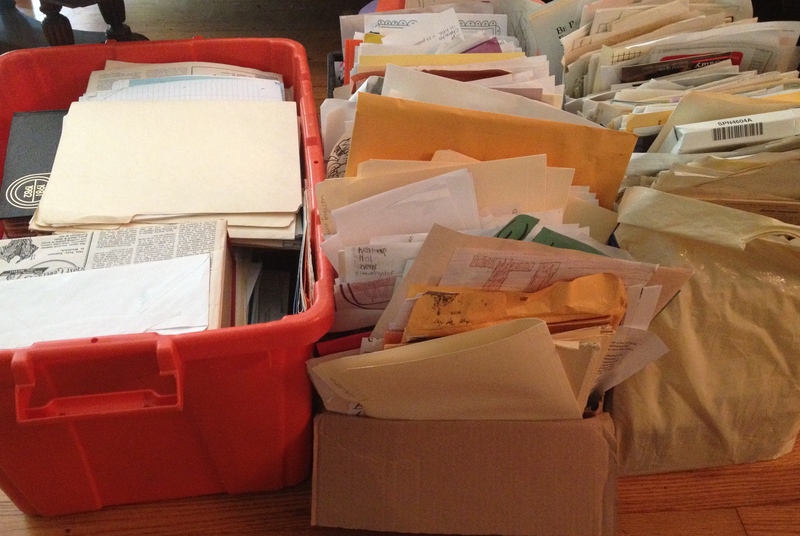 I could have gotten rid of one of the half-size filing cabinets as well, given how much stuff we ended up tossing away, but we decided to hold onto both of them–for now, at least. We can always change our minds once The Pods arrive, right? In all fairness, I should note that in going through all of these papers, I did find some documents that are legitimately important and worth holding onto… just as I’m sure that some of the kids’ school work that I saved will bring a smile to my face in the year 2024 and onwards. But by far, the vast majority of what we have been holding onto really had no value to anyone, emotional or otherwise. So why was I holding onto all of this paper for all of these years? This entry was posted in Uncategorized and tagged clutter, data overload, organization, reduce, simplify. Bookmark the permalink. Paper is the worst for me by far. It’s everywhere! I’m trying to find a place for just the important stuff, but it’s hard. Thanks. What I’ve been finding is just how much of the paper I think of as “important” really isn’t. I am still getting paper statements from my bank, for example–once we move, though, I think electronic-only makes more sense. If the paper comes into my house, I feel compelling to file it away! A couple of months ago, I lucked onto a “free shredding” day–given the volume of stuff we have to get rid of, I think I am beyond household grade shredders! I’m hoping I can find another drop-off site before July rolls around. I understand that, with the HUGE pile you have shredded this time around, I’m truly impressed! I hope you come across a new “free shredding day” soon. I do the same as Anne. Before filing away the completed taxes for the year, I shred some of the older stuff. Congratulations to you and your wife. What amazing progress in such short time. It’s great how it was all concluded and kind of symbolized by your placing the file cabinet out and it disappearing soon after. Must feel wonderful. Very inspiring. I’m a big fan of the curb side give-away–having been a “shopper” in the past. I’ve gone back and forth on whether or not to bother with a yard sale, or dropping things off at a consignment shop, or listing items online, etc. There may be a couple of things we unload that way (like the kids’ old school uniforms, which we won’t need once we move). But for the most part, I’d say I’m profiting plenty just by getting the stuff out of my house. You’re doing a fabulous and admirable job. I’ve found that giving stuff away is the very simplest and a great way to get rid of a lot of stuff at once. You guys seems to be mastering that very nicely. Awesome! I know from experience that was hard “head work.” Possible reward: re-watch your favorite bits from Stop Making Sense (grin). I actually still had notebooks from my undergraduate classes! Haha! I’ll bet Angela (=Nimue) does. But she went to Harvard, and I actually wouldn’t mind reading her notes from her class with Steven Jay Gould … if we could find them.